Last week was the start of the Spring semester. It was the first week of my last semester of classes for my Masters. I'm not graduating until this summer because I'm going to be doing my Amazing Capstone Project™ then. I started off the week a little worried because there were 4 classes that sounded really interesting that I could fit into my schedule, so I went to all of them in an attempt to help me decide what I wanted to do. On Monday I went to Advanced Digital Imaging, which in addition to teaching advanced digitization techniques is also going to teach us how to evaluate digitization hardware and software for a variety of mediums. I'm so excited about this class. It's going to be lots of hands on stuff and should be a lot of fun. On Tuesday I went to New Media Technology and Culture which is all the way across campus at Radio-Television-Film. This is a graduate seminar class with 100+ pages of reading for each class and in depth discussion and a large research paper. Should be really really interesting. I'm excited about taking a really intellectually stimulating class. Will be helpful if I ever decided to go for that PhD, as I really want to study the flow of information between internet and tv culture. I wish that queencimmy could take this class with me as I think she would just LOVE it. On Wednesday I went to Problems in Permanent Retention of Electronic Records, which was the one class that I wasn't signed up for. While it looked really really interesting, I decided that I wasn't going to take it. I already learned the basic issues and lingo of both archives and electronic records last year and while I understand that it's very important, I really don't want to be someone who archives born digital files. It's good that I know how to talk to those people, but I don't think I have the time to take the practical experience class when there are other classes that would serve me much better. On Thursday I went to Creating and Using Digital Media Collections, which is my fourth class with Gary (5th if you count my independent study last summer...). Another really interesting Gary class. We're going to be working with non-text based digital collections, including film & video. As I really like the idea of using video to enhance collections, I'm excited about this class. Also, I pretty much like any class Gary is teaching, although I really didn't need to here how to use his class web site for the 4th time ;). In addition to school, this semester I am going to be working on my heath. I am giving up Project Runway until I hit my first goal. This has seriously got me motivated. I went to the gym on Mon and Wed (just 30 min on the elliptical) and had a personal trainer session on Thurs. We had to do our warm-up in the hallway because all the rooms were busy. It was amusing. 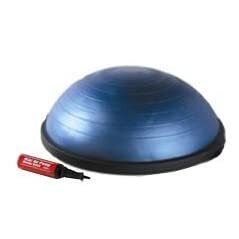 My PT is evil and makes me do crunches on a cut in-half balance ball which makes my legs protest. I also did my Cardio Pilates DVD yesterday. My body is so not happy with me, but in a good way. I also signed up for iTrain as a way of pushing myself when doing cardio at the gym. Just got the first 20 min iTread workout, so I'll see how it is. Ok, time to do my reading for New Media, as we don't have class tomorrow.